It has emerged that Jamaica's new prime minister, Portia Simpson Miller, aims to establish the country as a republic - just weeks after the announcement that Prince Harry will be visiting the Caribbean island in March this year. It's his first overseas trip where he'll be representing his grandmother. It's a visit which is meant to be celebrating her Diamond Jubilee. It's a visit which has now taken on added political significance. Prince Harry will be travelling to a Caribbean island which may decide it doesn't want his father as its next head of state. Jamaica's flirting with republicanism is nothing new. When PJ Patterson was prime minister he declared the time had come for a "head of state chosen by us". He set 2007 as the deadline. Five years on, the latest incumbent is championing his unfinished business. 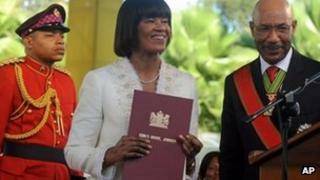 At her swearing-in ceremony, the Jamaican PM told an audience: "I love the Queen - she is a beautiful lady." Speaking in Jamaican patois, she said: "But I think time come." The prime minister also said, after being sworn in, that she would replace the Judicial Committee of the Privy Council in London with the Trinidad-based Caribbean Court of Justice as Jamaica's highest court of appeal. Such a move, she argued, would "end judicial surveillance from London". This desire to move on has been repeated by the Jamaica Information Service. It said in a statement that the government intended to begin the process of "removing all ties with the British monarchy, thereby becoming a truly independent nation". Rhetoric is one thing. Action quite another. Mrs Simpson Miller has plenty of more pressing issues to address in her country's 50th year of independence from British rule. The parlous state of the economy and crime were key issues during last year's election campaign. But a topic which was around when the Queen last visited in 2002 (her Golden Jubilee) is once more on the agenda when her grandson arrives (he's also going to Belize and the Bahamas) some time this year to mark her Diamond. He's likely to be well-received (the Queen was in 2002). Harry has an easy manner and a winning way with people. If the topic raises itself - as it will with Fleet Street following the prince - his officials will probably say independence is a matter for Jamaica and leave it at that. The development is far more troubling for Harry's father. The Prince of Wales will, at some stage this year, go to Australia (for the Diamond Jubilee) and be the guest of its Prime Minister Julia Gillard. She is on record as saying that the Queen's death would be "an appropriate point" for her country to move away from having a British monarch as head of state. At the moment, a hale and hearty Queen is head of state of the UK and 15 Commonwealth realms. Will that figure remain the same when Charles is on the throne?